This programme is designed to further qualify future leaders in politics, law, economics and administration according to the principles of good governance and to prepare them in a praxis-oriented course for their professional life. Very good graduates with a first university degree get the chance to obtain a master’s degree in disciplines that are of special relevance to the social, political and economic development of their home country. The knowledge and experience acquired in Germany should enable the scholarship holders to later contribute to the establishment of democratically oriented economic and social systems aimed at overcoming social differences. In addition, the training at German institutions of higher education should qualify the scholarship holders to become partners in the political and economic co-operation with Germany. With this programme, DAAD intends to contribute to the support of good governance and civil society structures in selected partner countries and regions. The scholarship scheme is open to graduates in the field of social sciences, political sciences, law, economics and in public administration from Africa, Latin America, South Asia and Southeast Asia, from countries in the Middle East as well as from the Ukraine . The scholarships are awarded for selected master´s courses at German institutions of higher education listed below. The study programmes starts in September/October 2018. The courses have an international orientation and are taught in German and/or English. Prior to their study programmes all scholarship holders receive a 6- months-German language course from April 2018 to September 2018. The language courses take place at selected institutes in Germany and not at the universities of the selected master´s courses. The language course is compulsory also for those who attend a master´s course taught in English. The scholarship holders are offered a special tutoring at their host institutions financed by DAAD. Furthermore, there is the possibility to attend networking events. DAAD pays a monthly scholarship rate of currently 750 €. The scholarship also includes contributions to health insurance in Germany. In addition, DAAD grants an appropriate travel allowance and a study and research subsidy as well as rent subsidies and/or allowances for spouses and/or children where applicable. 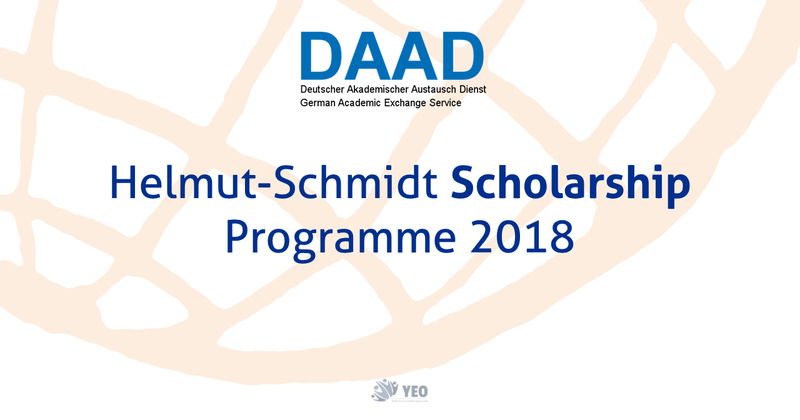 DAAD scholarship holders within the Helmut-Schmidt-Programme are exempted from tuition fees. The main DAAD criteria for selection are the following: the study results so far, knowledge of English (and German), political and social engagement, a convincing description of the subject-related and personal motivation for the study project in Germany and the expected benefit when returning to the home country. The latest university degree should have been obtained during the six years prior to the application for the scholarship. Applicants cannot be considered if they have stayed in Germany for more than 15 months at the time of application. All master´s courses have further additional requirements that must be fulfilled by the applicants in any case. Applications have to be submitted in German or English. Please indicate that you are applying for the DAAD Helmut-SchmidtProgramme (Master’s scholarships for Public Policy and Good Governance). Please submit your applications for the selected master`s courses and for the DAAD scholarship to the respective universities only (not to DAAD). The application period at all 8 universities lasts from June 1 st to July 31st 2017. Applications sent to the DAAD will not be forwarded to the respective course/university. They become property of the DAAD and will NOT be returned. The applicant has no right to claim for reimbursement. You are allowed to submit your application for up to two master`s courses listed below. Please fill in the DAAD application form only once making clear which study course is your first and which is your second priority. Please send this same application form and the necessary documents listed below to the two universities of your choice. In case your application is sent to more than two universities or if non-specific priorities are given your application will not be accepted. If you fail to follow the given procedures, you will be excluded from the application process. The committee selecting the candidates at the end of 2017 consists of professors responsible for the respective study programmes and of representatives from DAAD. All applicants will be informed at the end of the selection process – approx. by the end of December 2017.